People who take proton pump inhibitors (PPIs) may need to limit or avoid their exposure to certain medicines or foods due to potential interactions. 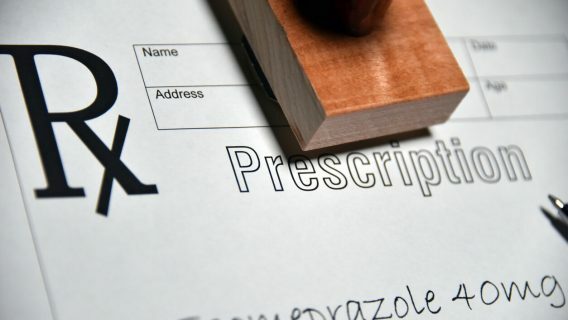 Patients should discuss all medications and supplements they are taking, as well as any dietary restrictions, with their doctor prior to taking a PPI. Proton pump inhibitor (PPI) interactions can occur with at least 290 medicines. These other drugs come in both brand name and generic versions. They add up to more than 1,800 different products. At least 20 of these drugs can cause a severe reaction if taken with certain PPIs. PPI interactions can also happen with food and drink. Certain foods may reduce PPIs’ effectiveness. Patients should ask their doctors which foods to avoid when taking PPIs. It is important that people talk to their doctor about all potential interactions before taking a proton pump inhibitor. Proton pump inhibitor drug interactions can happen with medicines ranging from aspirin to cancer drugs. People should be aware of how proton pump inhibitors interact with other drugs they take. PPIs alter the pH of the stomach. The pH is a measure of stomach acidity. An altered pH can change the way certain drugs work within the body. It can affect the way the body absorbs or filters them. It can also change the way the body activates certain drugs. Not all PPIs have the same drug interactions. Doctors may recommend a different PPI if a patient is taking certain other medicines. Sometimes, they may recommend a medicine other than proton pump inhibitors. Plavix (clopidogrel) – blood thinner Omeprazole and esomeprazole block the enzyme CYP2C19. The enzyme is needed to activate clopidogrel. This can decrease the blood thinner’s presence in the blood. Ask your doctor about taking Protonix (pantoprazole) instead. Dilantin, Phenytek (phenytoin) - seizures Omeprazole affects metabolism with these drugs. It blocks the body’s ability to eliminate them. That allows them to build up in the blood stream. Ask your doctor about taking Protonix (pantoprazole) instead. Some medicines interact with all versions of PPIs. A doctor may reduce the dosage of certain PPIs. Or a patient may have to take a PPI alternative. Aricept (nelfinavir) and Edurant (rilpivirine) – antiretroviral HIV drugs PPIs reduce stomach acid, which increases stomach pH. This prevents the drug’s absorption. That can weaken the drugs’ effect. Ask your doctor about taking an H2 blocker instead. Harvoni (ledipasvir and sofosbuvir) – hepatitis C drug Harvoni depends on gastric acid for absorption into the body. PPIs decrease acid, preventing absorption. Ask your doctor about taking an H2 blocker instead or cutting back omeprazole to 20 mg daily. Trexall (methotrexate) – chemotherapy drug PPIs block active secretion of the drug in renal tubules. These are kidney components vital for filtration. The interaction can cause methotrexate toxicity. Ask your doctor about taking an H2 blocker instead. Watch for signs and symptoms of methotrexate toxicity. Lanoxin, Digitek (digoxin) – treats heart failure and abnormal heart rhythms This interaction can cause the body to absorb too much digoxin. Ask your doctor about taking an H2 blocker instead. Taking PPIs and H2 blockers like Zantac together can help for some conditions. But there is a minor interaction between PPIs and H2 blockers. This happens because of the way each drug works. Both reduce stomach acid. But they do it in different ways. H2 blockers block signals telling the stomach to produce acid. PPIs work later in the acid-making process. They prevent tiny pumps from producing the acid. But H2 blockers can decrease PPIs’ effects if people take them too closely together. People should space out doses between PPIs and H2 blockers when taking them together. Doctors may recommend taking the PPI in the morning and the H2 blocker in the afternoon or evening. People should wait four to 12 hours after taking an H2 blocker before taking their next PPI. The blood thinner Plavix (clopidogrel) poses a serious proton pump inhibitor drug interaction. Clopidogrel is also sold under the brand names Ceruvin and Clopilet. Clopidogrel prevents blood clots in patients with high heart attack and stroke risks. People should not take certain PPIs and Plavix or other clopidogrel drugs at the same time. PPIs can cut clopidogrel’s effectiveness almost in half. The U.S. Food and Drug Administration issued a warning in 2009. It said the risk was highest with Prilosec (omeprazole) and Nexium (esomeprazole). Plavix and similar drugs increase the risk of gastrointestinal bleeding. Doctors prescribe PPIs to lessen this side effect. But some PPIs may block an enzyme that Plavix needs to work. The enzyme, CYP2C19, causes a chemical transformation in Plavix. This activates its anti-blood clotting effects. A 2016 study found using PPIs and Plavix together decreased after the FDA warning. But about one-third of Plavix users still took PPIs. Proton pump inhibitors have no serious interactions with food and drinks. But a person’s diet can affect the underlying condition PPIs treat. This means PPIs may have a harder time providing relief. People should avoid foods that can trigger acid reflux. This helps them receive the full healing benefit of PPIs. PPIs work best when taken on an empty stomach. People should take most PPIs at least a half-hour before the first meal of the day. They should wait at least an hour after taking Nexium before eating. Drinking alcohol while taking PPIs can result in increased side effects and the worsening of gastrointestinal problems. It’s also possible alcohol will worsen the conditions PPIs are intended to treat, such as heartburn caused by acid reflux (GERD) and stomach ulcers. Alcohol increases stomach acid production. It also irritates the stomach lining. This combination can worsen ulcer symptoms. In some patients, alcohol can also slow ulcer healing. PPI interactions with alcohol can cause minor side effects. Drinking alcohol with Prevacid (lansoprazole) may cause drowsiness or dizziness. Consuming alcohol with Prilosec (omeprazole) can cause nausea and headaches. Certain people may be at greater risk of problems combining PPIs and alcohol. These include people with alcohol problems, dehydration and low blood sodium levels. These patients should avoid drinking alcohol while taking PPIs.